Keep Calm and Carry On, It’s Just a French Pogrom! This last Sunday though was very different. For starters, it was the first time that such a huge crowd was gathered. 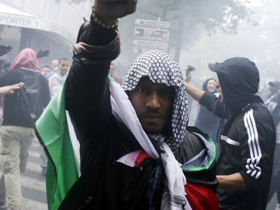 10,000-20,000 people will not go unnoticed on the streets of Paris, especially when they are heard shouting “Death to the Jews”, “F*# the Jews”, “Hitler was right”, “We will burn you” or “Jihad, Jihad, Jihad”. When some of the demonstrators called for prayer, several thousand started to shout Allahu Akbar, removing all doubt as to the ethnic/religious fabric of the angry mob. Freedom of speech and Freedom of religion are still in effect in France, but when such events take place, I question it all. The pro-Palestinian cause was really a cause worth fighting for, in the heart of some at least. Today it has simply morphed into an alibi for anti-Semitism. During these heinous demonstrations, Jewish people usually stay away from the area and/or stay inside their homes. So far it has proven to be the safest move from a very concerned Jewish community. But last Sunday was not the norm, and when a group of demonstrators started to walk towards the Rue de la Roquette Synagogue, everything took a turn for the worst.